As a brand, Hitachi power tools are known for their quality. The five best Hitachi power tool products compared and reviewed. 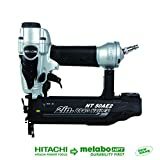 Generally, Hitachi power tools are synonymous with quality. The Hitachi brand name has been a key component of the construction industry for many years and continues to evolve and adapt as the market grows and develops. Most professional in the industry either own or have owned something from the Hitachi range and they continue to perform at the highest level. Purchased by both pro users and home improvement enthusiasts, the company appear to have at least cornered a large enough corner of the power tools market. The five best selling Hitachi tools are featured below - all examples of superior quality workmanship and value for money. Of all the Hitachi power tools currently available, by far the best selling product is the 2" Brad Nailer. The Hitachi nailer gives a very professional finish overall and will work well in an industrial environment. It feels more than capable when you're operating it and it really does make short work of any task you point it at. The Nailer will take any 18 gauge brad nails between 5/8 and 2". In the event that you come across a nail jam, there's a simple yet effective mechanism that deals with the problem.The price includes hex-bar wrenches, a smart carry case, a no-marring tip and a pair of safety glasses - that's all you'll need to go on to produce a high standard finish. Overall, a high quality product, a breeze to use and offered at a discount price too good to miss. This is the best Hitachi screwdriver and it's one awesome little power tool. It's powered along by a 1.5 AH ion lithium battery and this gives it the required amount of power - for up to three times the length of other battery packs. The torque is an impressive 44"/lbs and despite the fact that it's incredibly compact and streamlined, you feel as though you've got a little power house in-hand. There's an LED light built into the design, which is handy in a dark spot, plus bit changes are a simple task due to the 1/4 chuck. It's fairly packed with features, such as the ergonomic grip - which really is incredibly comfortable. Then there's the fact that the handle angle can be changed to suit, further adding to the comfort aspect and overall function. This is a fantastic compromise when it comes to size and power and the current discount is way too awesome to bypass. This is the best Hitachi power tool driver and the kit comes fully loaded. The price includes a top quality driver, along with a sturdy carry case, a fully functional flashlight, a quick charger and a single driver bit. The 22 stage clutch, 2-stage transmission and 230" /lbs of torque make this one a great choice for the hard-working professional. The grip is super comfortable, and it will hang pretty securely from a belt - which is always a handy feature when you're busy and working with an eye on the clock. Despite the power it puts out - by way of a 1.4 AH NiCad battery - it's surprisingly lightweight - always a bonus when you're in a tight spot or up and down ladders. This is a great little 12v drill, the best in its category and well worth the purchase price. This is the bets Hitachi compressor - though it's not the most powerful in the range. That said - it will more than suffice for most tasks. Despite its size and appearance it works hard, its power output is impressive: 2.6 cfm at 90 psi, plus it won't let you down when you need it the most. Having used one to respray a truck I can attest to its function and features - plus it whips air into tires with comparative ease which has got to be a huge bonus! The operation is quiet, it's 100% user friendly on the whole and it works well with a good range or air power tools. A definite recommended product from the Hitachi power tools range if you're on the market for an air compressor - and the price is so low it's awesome. 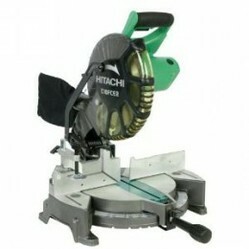 This is the best Hitachi miter saw - and the best selling overall. It comes with a carbide blade so it works right out the box and the 15 amp motor throws out an awesome 5000 rpm. It has a 0-52 miter range and a 0-45 bevel angle, which is sufficient enough to tackle most tasks. It will crosscut a wide range of pieces - from wood to ply, aluminum sashes, decorative pieces and more. It's incredibly lightweight, user friendly and will be right at home in a multitude of environments - home, workshop, hobby users and medium-weight pro use. The handle has a cool vibration reduction feature and it's a pretty quiet power tool overall. It's lightweight, it's portable - it's a best selling Hitachi power tool and an impressive miter saw in its own right - buy it.